It came as a shock last spring, at least to me, when BrightSource Energy decided to suspend its Hidden Hills Solar project near Pahrump, Nev. For starters, I had a story going to press whose conclusions were somewhat tied to the looming specter of Hidden Hills, a large concentrating solar “power tower” project which would have occupied five square miles of the Mojave Desert just north of Death Valley National Park. Plus, I’d always had the impression that the Oakland, Calif.-based BrightSource subscribed to Winston Churchill’s apocryphal dictum for success: “Never, never, never give up.” But while the company's ambitions have weathered controversies over funding, cultural artifacts and desert tortoise, it appears they have finally met their match: Birds that die in the specific kind of facility BrightSource specializes in. And not simply by colliding with towers or mistaking shiny solar panels for water. They die by burning. The problem figured prominently in public hearings over Hidden Hills, where researchers with the California Energy Commission described the bird-death problem in detail. That wasn't what derailed Hidden Hills, then-BrightSource spokesman Keely Wachs reassured the media; instead, the company just wanted to focus on a different project: A collaboration with Spanish developer Abengoa on a project in Riverside County, Calif., close to Southern California’s border with Arizona, called the Palen Electric Generating Station. Another developer, Solar Millennium, had won approval in 2009 to build a solar plant at the Riverside site, using parabolic solar trough technology — no towers, just long tubes of mirrors that heat water in tubes. After Solar Millennium went bankrupt, BrightSource and Abengoa took over, figuring that building Palen using BrightSource technology would only require an amendment to the prior application, allowing for the change to a new technology. 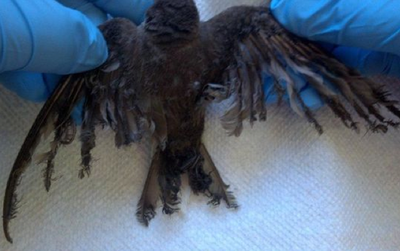 A bird that died at Ivanpah solar plant in California. Courtesy California Energy Commission / BrightSource. The changeover proved more difficult than predicted. Fearing that the Palen project would “very likely result in significant and unmitigable impacts to biological resources,” the California Energy Commission issued a decision to deny the amendment to the application December 13. The commission was particularly concerned with potential injuries to birds who might fly through the field of solar flux, the intense heat and energy field that forms around the particular kind of plant BrightSource builds, in which fields of supplicant mirrors reflect sunlight up to a 500-foot tower. The sun's concentrated radiant energy zaps birds in mid-air — while they're migrating, feeding, or just flying around. The theoretical safe level of solar flux for birds is one minute of exposure at 5 kilowatts per square meter. In the skies above the Ivanpah Solar plant the Mojave on the California-Nevada border, solar flux near the tower is a hundred times higher than that. The facility has not gone into full operation — it's 99 percent complete and only partially online — and already dozens of birds have been found dead just in the the last few months. Some of the dead and injured are not species common to the Mojave; they may have been seduced by the illusion of water the mirrors present from the sky, and drawn into a death trap during migration. The list of affected species and the details of their potential deaths is long and grisly in the energy commission report. Swallows and swifts are at risk because they migrate during the day; flycatchers because they feed during flight; hummingbirds because they’re so little. Raptors, turkey vultures, doves, owls, house finches, thrashers, eagles and hawks are all mentioned as birds that could die from long periods of contact with “high-intensity solar flux,” while shorter exposures could “cause tissue or feather damage that could impair flight or vision.” This latter impact has been known at least since 1986, when a research team led by California orinthologist Michael McCrary published a paper in the Journal of Orinthology called, “Avian Mortality at a Solar Energy Power Plant.” McCrary found that a small number of birds from seven species died by burning in the solar fields of a relatively small plant near Daggett, Calif., but concluded that many more die in collisions. Image from the 1986 report, 'Avian Mortality at Solar Energy Plant' by Michael McClary. And some birds that migrate in crowds, like the Vaux’s swift, could “potentially suffer catastrophic, single-incident adverse consequences” if a large flight of migrating birds flies into the flux field. There’s no official word yet from BrightSource on the fate of the project. Keely Wachs left in September to work for Clif Bar, and the solar company's new spokesman has only issued a statement saying the company is reviewing the report. The California Energy Commission on Tuesday put out word that the decision isn't final, and BrightSource has asked for (and been granted) "a chance to present more scientific evidence about bird deaths and the project’s benefits." Once again, however, it may be worth consulting Churchill. Evidently, despite the many pendants and t-shirts with the never never quote bearing his name, what the man really said, to a group of 29 schoolboys in 1941, was "Never, never, in nothing great or small, large or petty, never give in except to convictions of honor and good sense." It may be just honor and good sense to spare the birds of the southwestern deserts more terror. Correction: An earlier version of this story stated that Abengoa would provide storage at the Palen plant. While Abengoa does use storage at its Solana solar plant in Arizona, the company would only be involved in the Palen plant's construction. Judith Lewis Mernit is a contributing editor to High Country News. She tweets @judlew.